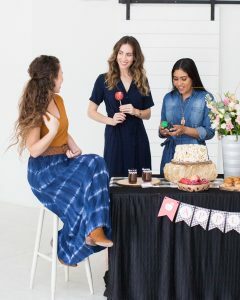 Baby showers are so exciting; the celebration of new life! 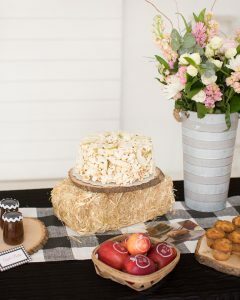 Since I am a farmhouse design lover, I was inspired to create a baby shower theme to complement that style. 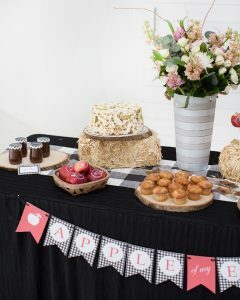 Inspired by fresh apples and Spring, this “Apple of My Eye” baby shower concept was born. 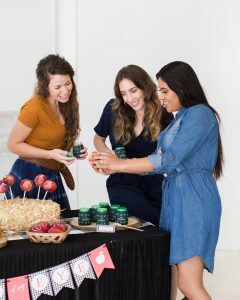 We are sharing ideas for decorations, baby shower activities, snacks and party favors below! So, keep scrolling!! Some of my favorite farmhouse elements were incorporated into our shower’s design; wooden baskets, galvanized metal, rustic wood and a variety of fabric textures. To anchor our table’s design, we chose a simple, floor-length black linen. Softness was created through the addition of a tall floral sitting in a fun, textured galvanized pail. 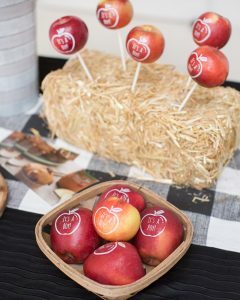 Mini hay bales acted as snack and dessert stands, displaying our custom-made apple popcorn cake by Popped Passion and imprinted apples on sticks. 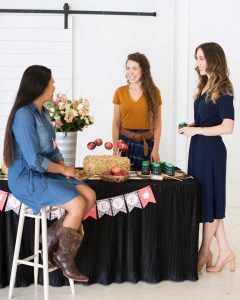 Party favors, apple pumpkin muffins and our tasting activity were displayed on rustic wooden rounds, then we added additional whole apples in small baskets to either side. 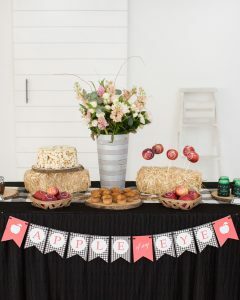 To pull the entire look together, we added a printable gingham “Apple of my Eye” banner to the front of the table, available as a FREE download at the end of this post. 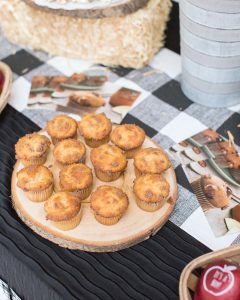 In addition to fresh, whole apples, we served spiced apple pumpkin muffins for our baby shower guests. 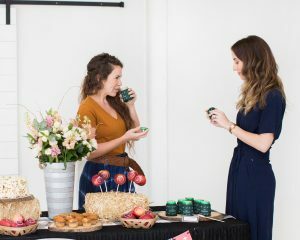 When hosting events, I keep snack items simple, and theme relevant. For our morning baby shower, these two snack options were perfect! Preheat the oven to 350 degrees. Line a 12-cup muffin pan with paper liners. In a large bowl, whisk together sugar, Beech-Nut Naturals apple and pumpkin, oil, milk and eggs until smooth. In a separate bowl, stir together flour, cinnamon, ginger, baking soda, cloves and nutmeg until well combined. Stir flour mixture into Beech-Nut Naturals apple and pumpkin mixture, just until no streaks remain; fold in apples. Divide evenly among prepared muffin cups. Smooth tops and sprinkle with pecans. Bake for 25 minutes or until tester inserted into the center of the muffins comes out clean; transfer to wire rack. Let cool completely. To find Beech-Nut Naturals near you, visit www.BeechNut.com. When hosting baby showers, I like to keep activities minimal, yet relevant for party guests. 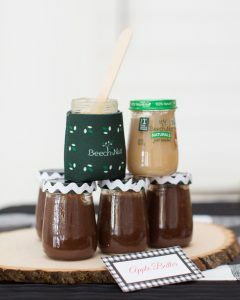 For our apple of my eye baby shower, we set out a variety of Beech-Nut baby food jars, covered with adorable koozies, and encouraged guests to guess the flavors. We selected the Beech-Nut® Naturals™ line as it was created with input from moms and dads, and was inspired by homemade. 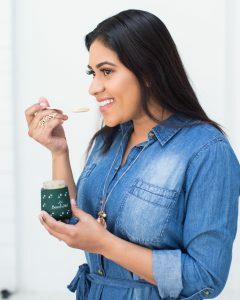 Each jar is made with real fruits and vegetables, just like you would use at home. Party guests could smell and/or taste flavors, with prizes awarded to those who guessed the most flavors correctly. I love a great up-cycled craft concept! 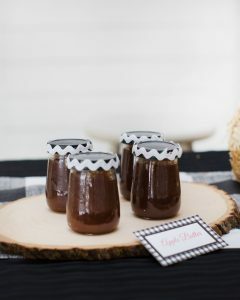 For this apple of my eye baby shower, we up-cycled Beech-Nut baby food jars for our party flavors. After removing the labels, we washed each glass baby food jar thoroughly. The baby food jar lids were spray painted using 2 coats of black. Then, we added a zig-zag white fabric trim to the top’s edges once dried as a decorative element. 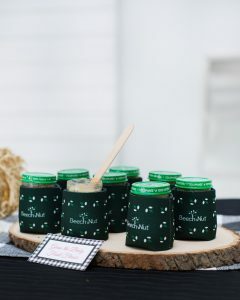 The Beech-nut baby food jars were then filled with homemade apple butter, for a fun, theme relevant party favor for guests. 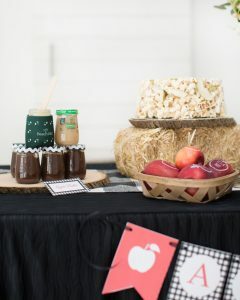 We hope our Apple of My Eye baby shower offers inspiration for your next gathering. 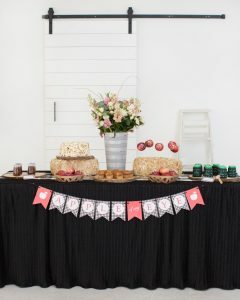 Browse our baby shower blog archives for more fun ideas! P.S. Don’t forget to download your FREE copy of our “Apple of My Eye” banner!